Donald Anthony was hooked on fencing when he first learned to lunge, parry and riposte at the age of 8 in his hometown of Cleveland. “I love the opportunity to constantly learn and perfect your technique,” said Anthony, 59, who helped lead the resurgence of American fencing, first as a competitor, and in recent years as president and chairman of the board of USA Fencing. 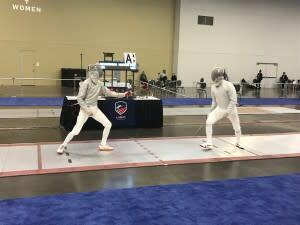 Anthony – who is still a top age-group fencer – had the opportunity to learn a little more the past few days, as he was one of the 1,500 fencers competing in the saber, epee and foil events at USA Fencing’s January North American Cup at the Greater Columbus Convention Center. The event attracted the top fencers from all over the United States and beyond, including several Olympians. 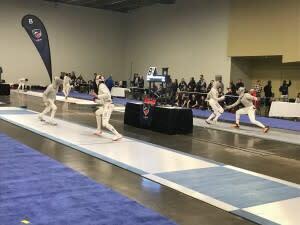 The action was fast and furious and the convention center was filled with the sounds of clanking swords, squeaking fencing sneakers and the primal screams of the competitors. Columbus has become a fencing hub in recent years and the leadership and enthusiasm of Anthony and Ohio State coach Vladimir Nazlymov have led the way. “I definitely think this is one of the best fencing areas in the country,” said Celina Merza, who came from New Jersey to fence for Nazlymov at Ohio State. The 2016 graduate is now a volunteer assistant coach at Ohio State, and she finished 6th in the Div. I Women’ Saber competition at the North American Cup. Nazlymov came to Ohio State in 1999 and quickly turned the Buckeyes into a fencing power. His teams have won three NCAA team titles and finished second in 2016. Nazlymov knows a thing or two about Olympic medals. He won three gold medals, and six medals total while competing for Russia in the team and individual saber events. About 30 of his current Buckeyes competed in the USA Fencing event, and many former Buckeye fencers were in Columbus to compete or coach. Such as Terrence Lasker, the coach of Nellya Fencers Club in Atlanta. Lasker grew up in Kansas City, where Nazlymov started a youth and high school program in the early 1990s. Lasker became a world-class fencer and won a bronze medal at the 1994 Cadet World Championships, which was a huge step forward for fencing in this country. He followed Nazlymov to Ohio State and was an assistant coach for several years before leaving to coach Nellya Fencers. Two of the Nellya Fencers – Edith Johnson (3rd) and Lark Izenson (11th) – made it to the quarterfinals of the Div. I Women’ Saber competition. Zara Moss won the competition, which featured several world-class fencers and a lot of exciting matches – and screams. Sarah Merza, Celina’s younger sister and a Buckeye freshman, was 17th in the Div. I Women’s Saber Final. Ah, emotions: The key to fencing. Anthony had an unexpected chance to perform at the North American Cup, which is a major tournament in qualification for Senior World Championships in July as well as Junior and Cadet World Championships in April. This was the first time it has been held in Columbus. “I got a call at 7 this morning, they said I had to compete, they were short a man,” Anthony said. And so, he did, in the Senior Team Men’s Saber with the Columbus Fencing & Fitness Buckeyes. They finished 6th, while the Columbus Silver Jackets were 4th. The Silver Jackets team included Mikhail Mironovas who, of course, has a connection to Anthony and Nazlymov. Mironovas, 49, learn to fence growing up in Lithuania and was a member of the country’s national team. He and Anthony often train together, sometimes with the Buckeyes, and both get a little coaching advice from Nazlymov. Anthony has also helped change the fencing landscape here, at the club level and at the national level. He was instrumental in bringing the 2013 and 2014 USA Fencing National Championships to the city.